Yes, I just titled a post with the word “easy”. No, I have not gone over to the dark side. I still love complicated, multi-day bread recipes, recipes that require trips to three different markets, and slow-smoked pork. But sometimes, I cook to satisfy a craving, and I want immediate results. I often feel this way about sweet baking—I want to eat cake/pie/cookies/brownies, now, dammit. So I keep my eyes open for straightforward baking recipes using my pantry staples: nuts & nut butters, almond flour, cornmeal, wheat flours, chocolate, eggs, butter, olive oil, sugar, cane syrup, honey….and I had French almond cakes on the brain after eating an excellent raspberry financier at Gracious Bakery a few weeks ago. Except I launched into this chocolate financier recipe only to discover I was out of cocoa powder. No problem–I substituted Orleans Coffee Exchange’s high-quality hot chocolate mix (ingredients: ground cocoa and sugar) and merely reduced the amount of powdered sugar in the batter. The recipe is blessedly simple: mix almond flour, sugar, and cocoa powder together in a bowl, then stir in egg whites and melted butter. That’s it: one bowl, one spoon, and a mini-muffin tin. Technically, the resuting cakelets aren’t true financiers, as the classic methodology requires the butter to be browned before adding it to the batter. To dress up the little cakes, I dropped a few sliced almonds into each muffin cup, then sprinkled a few more atop each portion of batter. The substitution and almond-slice embellishments worked beautifully, and I can feel a mini-obsession with financiers beginning to develop. I am itching to try a more traditional, browned-butter version, as well as this fresh-berry variation. I had some incredibly good pistachio financiers at Sandbox Bakery (http://www.sandboxbakerysf.com/) in San Francisco, years ago, that I still dream about. I’d love to find the recipe for them. Seriously fantastic. Not yet, I haven’t been there, but looking at the menu, I can certainly see that I need to. 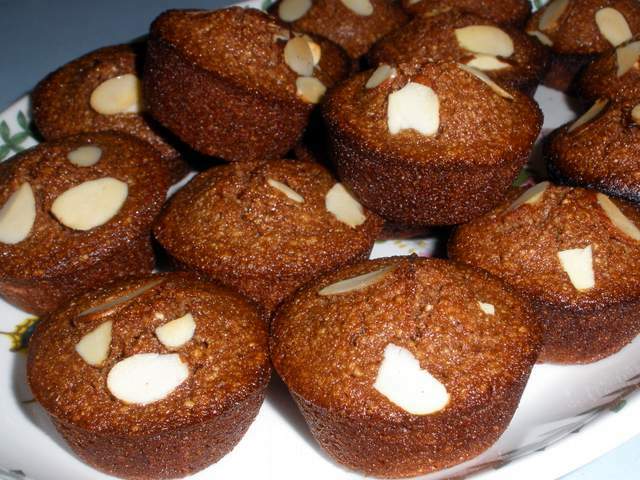 What kind of financiers did you have there? Classic almond, each topped with a single cranberry. Everything I’ve sampled at Gracious has been excellent.